The Heart of the Continent Partnership has partnered with National Geographic Society (NGS) to create a regional geotourism initiative, including an interactive map and website. We are accepting nominations for places, activities, and businesses to be included in the website. Go to traveltheheart.org and nominate your business, or nominate a special place that needs to be shared. There are instructions about how to register and what to include in a nomination there. Drawing input and involvement from a wide spectrum of local stakeholders, this geotourism project will help sustain and enhance the geographical character of the region — its environment, culture, aesthetics, heritage, and the well being of its residents — by highlighting the outstanding natural, cultural and historical resources and historic gateway communities in the Heart of the Continent bi-national region. HOCP will become a part of NGS’s network of interlinked geotourism websites, gaining great visibility, visitor-ship, and awareness for our region — and its wonderful natural and cultural assets. Geotourism is tourism that sustains or enhances the geographical character of a place—its environment, culture, aesthetics, heritage, and the well-being of its residents. Geotourism incorporates the concept of sustainable tourism — that destinations should remain unspoiled for future generations — while allowing for ways to protect a place’s character. Geotourism also takes a principle from its ecotourism cousin, that tourism revenue should promote conservation, and extends it to culture and history as well, that is, all distinctive assets of a place. What are examples of other places that have geotourism initiatives? NGS’s Center for Sustainable Destinations has partnered with a host of regions to create a framework for engaging communities and creating a regional geotourism infrastructure in locations across the world. Some examples in the United States include the Four Corners Region, Greater Yellowstone, the Central Cascades and California’s Redwood Coast. The Crown of the Continent region is another example of trans-boundary geotourism project that encompasses Montana, Alberta and British Columbia that participate in the NGS Geotourism program. “What is Heart of the Continent? Cross-border collaborative promoting natural, economic health of vast area, from Quetico to Lake Superior, including Ely attractions. “ Ely Echo. 29 Aug 2014. “Heart of the Continent and National Geographic: Important Opportunity For Your Business,” International Falls Chamber Email: June 2014. “Bi-National Tourism on Heart of the Continent Agenda,” Net News Ledger (Thunder Bay), May 28, 2014. “Nominate Special Places for National Geographic Guide to the Heart of the Continent Region,” Wilderness News Online, May 15, 2014. “Heart of the Continent geotourism project to be launched,” Hometown Focus (Virginia), 25 April 2014. 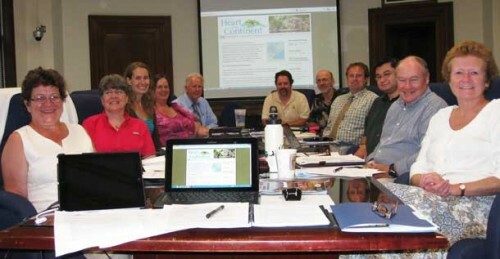 “Heart of the Continent Map Being Developed,” The Lake 89.5 (Kenora), 24 April 2014. “Heart of the Continent Seeks Tourism Areas to Promote” CFOB Radio (Ft. Frances), 23 April 2014. “Partnership with National Geographic,” Mesabi Daily News, 23 April 2014. “Tourism website needs input on Northwestern Ontario Attractions,” CBC News (Thunder Bay), 24 April 2014. “Frank Jewell receives award for dedication to the Heart of the Continent Partnership,” Lake County News Chronicle, 28 March 2014. 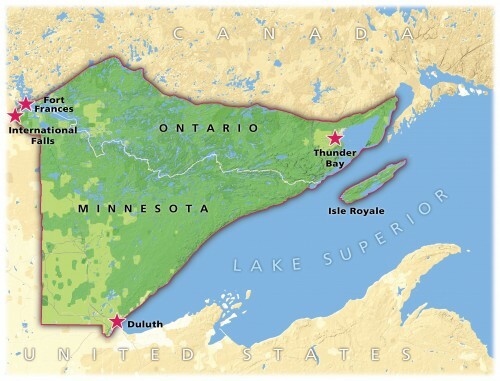 “Ontario and Northern Minnesota officials are touting a “geotourism” partnership with the National Geographic Society.” WDSE Public TV (Duluth), Almanac North, 28 February 2014. Frank Jewell and Jim Dion NGS are interviewed. International Tourism Agreement Reached: Heart of the Continent, National Geographic launch online portal,” Atikokan (Ont.) Progress, 18 February 2014. “Promoting Geotourism on both Sides of the Border,” St. Louis County Newsletter, 14 February 2014. “Tourism Partners,” TB Newswatch 14 February 2014. “International Tourism Agreement Reached,” The Journal (International Falls), 13 February 2014. “International tourism group teams up with National Geographic,” CBC News, Thunder Bay, 12 November 2013. Audio/CBC Radio link. “International Falls wants to capitialize on old foe, Voyageurs National Park,” Minnesota Public Radio, 24 October 2013. “Heart of the Continent Partnership Works to Promote Canadian-American Border Lakes Region,” WTIP (Grand Marais) 24 September 2013. Interview with Frank Jewell. 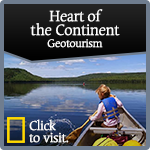 “Heart of the Continent Partnering with National Geographic,” Net News Ledger (Thunder Bay), September 21, 2013. “HOCP nears launch of geotourism partnership with NGS,” The Journal (International Falls), 17 September 2013. “Marketing area as a whole is key: Speakers,” Fort Frances Times, September 11, 2013. “Leaders Tout Border Collaboration,” The Journal (International Falls), 10 September 2013.